We recognize that these products are new in the U.S., therefore we want to offer a variety of brushes and accessories at a reduced price. These kits will show you the quality, design, and how great these tools are to work with. Nothing replaces actually having the products in your hand. Our scraper kits have become very popular and prepare you for any shape of molding you may run across while scraping and removing paint. The Silent Paint Remover Kit includes everything you need to safely remove multiple layers of paint and varnish using gentle infrared heat technology. Semi-Professional Kit includes: (1) 1 1/4" (45 mm.) Natural Bristle brush, (1) 2 3/4" (70 mm.) Synthetic Filament Brush, (1) 1" (35 mm.) 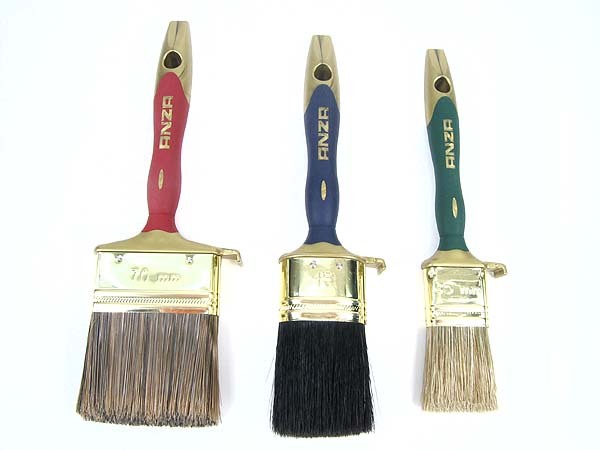 Mixed Natural Bristle and Synthetic Filament Brush. ©2005 Viking Sales, Inc. All Rights Reserved.